There’s a certain yin-and-yang that comes along with talking to Richard Sanz, the winemaker who runs Menade in Rueda along with his brother and sister. While he riffs on being 100% organic and natural (which they are) and strategically planting herb and flower gardens near his vines to encourage pollination (which they do), he’s also the type of guy who can curse up a storm and might just try his hand at brewing beer (which he does), because why the heck not? Disregard any preconceived notions you might have about the people or place that might make natural and organic wines. If you’re thinking it’s a super rustic, flower-power type of operation run by a “yeahhh mannn” type, one trip to their winery will show you otherwise. Inside, it’s all about modernity with a bold flair for color and comfort, something you clearly get when talking to Richard as well. As his hands swirl like a typhoon as he expounds the virtues of natural farming, but it’s not because it’s the cool thing to do. It’s because it’s the right thing to do, Richard says. Speaking of transcendentalism, it doesn’t need to be a deep spiritual journey — though that doesn’t hurt. Richard knows that his product and the products of fellow winemakers can have a similar effect, be it on the winery’s balcony or thousands of miles away in far-away continents. 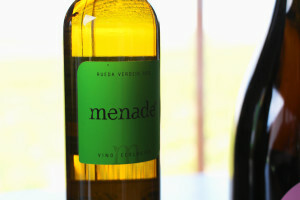 We greatly encourage you to interpret the world of Menade wine — preferably chilled in a glass of your choosing. 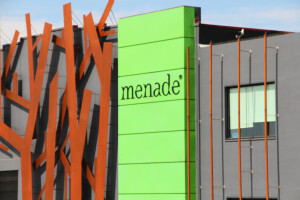 Visit Wine Searcher to buy Menade. Colour: Yellow with golden tones and hues. Aroma: Aromatic intensity and complex display of various essences reminiscent of mint, cilantro, fresh basil with soft tones that evoke touches similar to mandarin tangerine skin. Palate: Fruity, round with light integration of fruit that reveal papaya and passion fruit, wrapped in a strong component of texture. Colour: Straw yellow with green reflections, clean and bright. Aroma: Concentration of varietal and mineral aromas. Emphasized aromas of white fruit intermingled with hints of herbaceous type, notes of laurel, fennel and aromatic plants of low mount (such as thyme). Palate: Dry, balanced and tasty. Certain bitter touches, typical of verdejo. Round with volume. Natural acidity holds a long and elegant finish. Colour: Pale yellow with green hints, clean and bright. Aromas: In Menade, we smell the first day of harvest and damp soils. It tastes as walk on the castilian plateau; must, grape, natural. Palate: We find a verdejo as they were before. Varietal aromas from verdejo grape, with volume, elegant and well-balanced. Colour: Predominance of yellow, bathed with golden reflections. Aroma: Immediate presence of minerals, smoked and mature/ripe fruit. Unforgettable herbaceous currents like thyme, laurel and fennel. Palate: Fatty, rich with a lot of volume. An extensive and fresh aftertaste. Elegance, personality and tipicity are found at the end of this wine. Talking with Antonio Diez Martin, his oozing energy and upbeat charisma are the first thing that you notice. He’s got that thing in his voice, that glimmer in his eye, that those people who simply enjoy life just have – and it’s intoxicating. Scan the rows of wine on the shelf of your local wine shop, and there’s one bottle of Rueda that’s bound to catch your eye, should it be in stock. But it's what's inside Shaya's striking bottles that keep wine-lovers coming back for more. The way that the Ortega family started their now-bicontinental O. Fournier winery is not your typical family winery tale.